I have a horrible habit of trying to eat healthy and then falling off the wagon. Don't get me wrong the majority of the time I eat very healthy, but making big changes in my diet always seem to take a number of failures before they are successful. In college I ate a ton of restaurant food. There were always cheap places to eat and I rarely made food at home. Eventually it caught up with me when I realized that I never seemed to have any energy and I generally felt run down. I vowed to change my habits and I did until I started graduate school and then I was back to my old habits. After getting married I vowed again to start eating healthier, then I got pregnant and the smell of meat made me sick. To compensate I ate a ton of ice cream and peanut butter. After my first son was born I reformed and gave up pretty much any bad food while I breastfed. Then I became pregnant again and my bad food habits quickly came back. So over the years I have started and stopped a lot of healthy eating plans. Luckily since having my youngest and starting this blog my eating habits have leveled off. 99 percent of the time I eat healthy and the other 1 percent I remind myself that I'm human. Since my husband's dad had heart surgery last year I have been determined to make my husband healthier. He has lost 30 pounds in the last year and a lot of it has had to do with dietary changes. This week I made a new healthy recipe for Southwestern Vegetable and Chicken Soup from the February 2013 issue of Eating Well magazine. This recipe has 16 ingredients. It takes 1 1/2 hours of total time, 1 hour of which is active and makes 8 servings. I did make a few changes to the recipe. First I made my own chicken stock from scratch. It really does taste better and is a great way to save money. Second, instead of diced canned tomatoes I used one fresh tomato. I am trying to use more fresh ingredients and rely less on canned goods. Plus the price of fresh tomatoes is lower than canned currently. Finally, I also used fresh spinach and I cooked my own beans. I love that this recipe is high in vitamin C and only has 5 grams of fat and 199 calories. 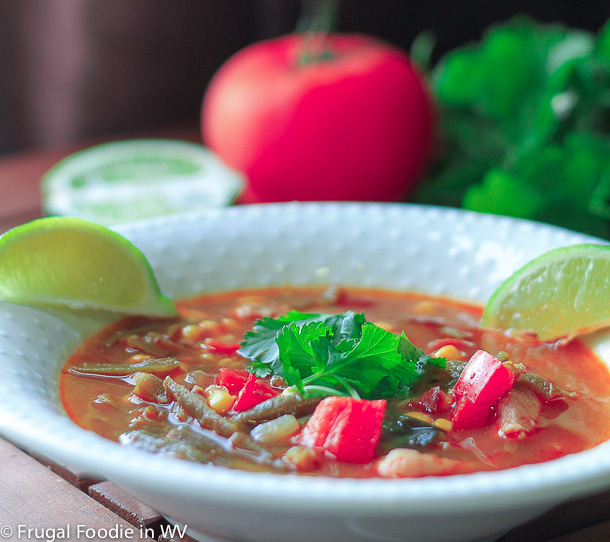 It has great flavor and the lime juice makes the soup delicious. I tasted the soup before adding the lime and the lime makes a tremendous difference. Make sure to salt at the end, especially if you are making your own stock or using low sodium store bought. This recipe could easily be modified to being vegetarian by omitting the chicken and using vegetable stock instead of chickens stock. For the recipe go to Southwestern Vegetable and Chicken Soup. hmmm! healthy and delicious..thanks for sharing dear. Thanks :) It really is healthy and tastes great! Roasted a chicken in the crockpot yesterday. I've got the leftover liquid and will soon have the bones to make my own stock. You are right... much better! This looks yummy. I'm slowly trying to ease us into eating clean this year. It's hard! This sounds and looks so good. I am definitely going to try this one. Thanks :) If you try it tell me how it turns out for you! I'll bet yours tastes even better with the homemade stock in there. Delicious! This is a terrific healthy meal. I am in the same boat as you when it comes to eating healthy then blowing it! So many good desserts out there, and fried foods. Eat healthy most of the time and fall of the wagon now and then. Thanks for posting this. Looks really yummy and healthy especially during this cold weather. Stopping by from Nanny to Mom blog hop. It really is great for the colder months :) Going over to check out your blog! This looks so good! Found your blog through Made in a Day and I'm a new follower! Thanks :) Returned the favor! found you through Favorite thing Friday... Following you and would like to invite you to our Foodie friends FRiday Linky Party. Come and join the fun and link up to 3 recipes. following from the aloha friday hop! The link didn't work :) I will remember to try to enter next week though! Thanks for the heads up! Found your post on Create & Inspire Friday Link Party. This soup looks so good. I will have to add it to my list of recipes to try! If you try it tell me how it turns out!